This is supposed to be What Malaysians Should Do When They Got Sick (Part Two) however, I managed to do a specific theme on this so I just rename it to Good Practice To Do When You Meet a Doctor (Malaysia). You see, the contents of my first post seemed a bit all over the place. I have a lot of things to tell but I don't really have a good way to make it seems more structured. It was like I'm just pouring out words after words. However, this time I got it structured better hence the title. 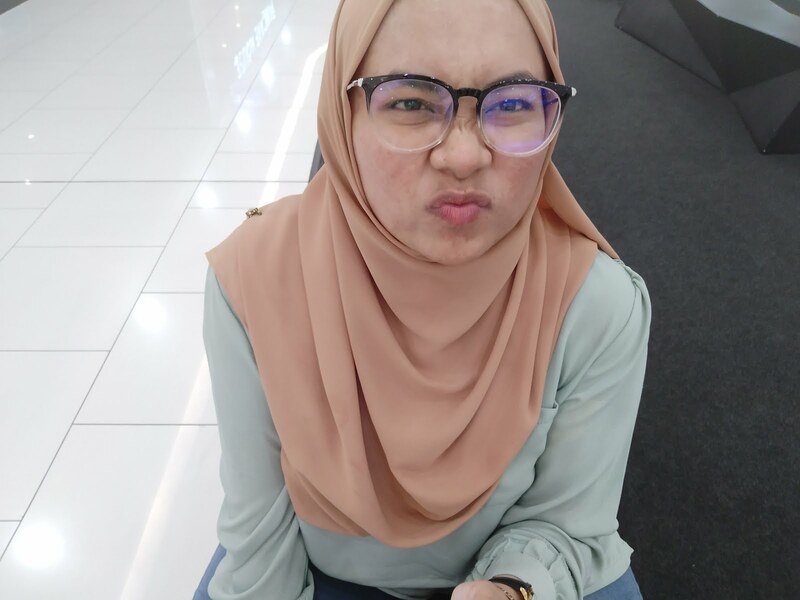 If you didn't read the first one, these posts are like my personal sharing on good health practice that I think Malaysians may not know (and you guys should know). I am so urging you guys to read part one since most important stuff (especially #3) were shared there. One that truly bothers me as a pharmacy student is that some of us people still live in this minded that whatever the doctors say is not really true because they are made to trust "western" opinions more and know nothing about these magical solutions from nature. That's is so wrong, we were a simple Malaysian first and "western-school-brainwashed" second. Actually, that kinda makes all the differences. We get the benefit of both worlds and that is exactly why you guys should trust us more. Ok, I was being too emotional but the point is, you should trust your doctors that they only want the best for you. Tell them your condition properly and if you have any issues about the medicines or the approach they used, don't be afraid to talk! Be more involved in your condition and just unravels any confusion you have right there and then. Especially if the doctors been asking if you take any health drinks or supplements or if you've been slacking on your medicine. Malaysian wasted millions every year by throwing their medicine away which can be solved if we just start sharing why we do it and how to get around it. When we were in UKM KL, we have a panel clinic and funnily the clinic only cover about RM35 (if I'm not mistaken) of the medicine for each visit. Medicine, being an expensive thing they are, can easily go beyond that range so the doctors will ask (knowing we study health, we might have some medicine we stashed somewhere, usually Panadol jelah) if we got painkillers or if we truly need that medicine for this and this because earlier you say it only bothers you a little. We can ask for a refund at the faculty but it is kinda troublesome and well, we are young peeps, some toughened up would do us some good. Anyway, that got me thinking that sometimes you might don't need certain medications and then you can save the guilt of wasting it but some other times you might really could use the medicine. I know some of us opposed having medicine because we are so tough like that, but most medications are there to make that little suffering ease a little and won't leave any residual effect at all. That way even with some pain here and there you can still operate. For example, when I have my cold, I will have a horrible sore throat that even though my body isn't that weak or anything, I will still feel so troubled with the sore throat. The best medicine to ease it for me was this mild steroid that people always thought too dangerous to risk my life over a simple sore throat. Or taking this Panadol menstrual cramps tablets almost on each first menstrual day so that I won't end up curled on the bed all day long and people think I will lose a kidney one day for that. Stop being so scared of medicines, there are billions of dollar spent for a medicine developing research just to make sure it is safe and the process is so so so strict. #4 To finish the medicine or not? Have you heard about how important to finish your antibiotic? Because it is so true like the truest thing ever kind of true. Antibiotic mean anti (oppose) biotic (living, which is, in this case, the bacteria). Some diseases that are caused by bacteria can be treated by antibiotic and you will always see kids that have a cough ended up with that powder antibiotic that you need to mix it water and all. Do notice that bacteria and virus are not the same thing, Simple cough and cold are usually viral so you won't get antibiotic. 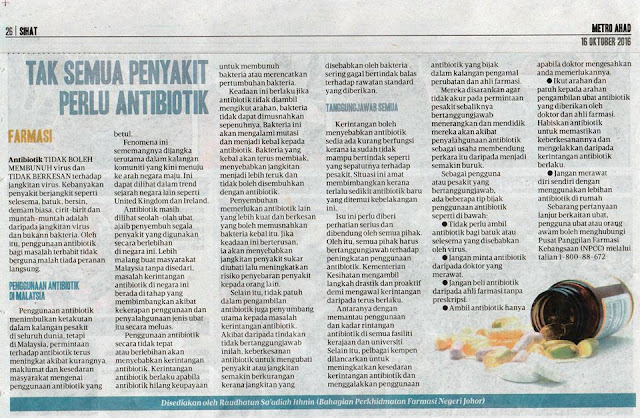 However, kids are more prone to bacteria (can be lethal too) and that is why the safest practice is to give that antibiotic and it would not be as effective as it should be if they didn't finish it. Imagine a war between the orcs and the men (yes, this is LOTR references). The orcs (bacteria) will always try to attack men (human). The fort (our immune system) can hold up but if the attack is too much, the fort may fail and that is when we got sick. However, say that just as the fort failed, lots of elves (antibiotic) come in and drew the orcs out of the fort, then the men are saved, right? Imagine if they aren't lots of elves (you didn't finish all the antibiotic). Then the orcs may destroy more things and gain more information about the security detail of the fort before finally been drawn out of the fort. This is why it is important to finish the antibiotic. You need all of the antibiotics to truly exterminated all the orcs/bacteria inside you or else they can still lurk somewhere in your fort to learn about all your weak spot. When they learned it, they can have an upper-hand in the next attack (bacterial resistance). Now, you will suffer for a longer time than before truly defeats all the orcs even with the help of elves. But what if these continue? You will need more elves (more expensive antibiotics as now you need a stronger antibiotic). Some medicine, however, serves as a temporary solution to ease your day. Like my Panadol and sore throat story. If you think you are well enough, you can stop it. However, in a more important case like diabetes and hypertension, religiously eating the medicines is what keeping the sugar level and blood pressure normal. If you skip it, it will just return to the high readings. How to know? Ask your doctor. You can trust yourself to just read it online. To truly understand health and medicine material require background knowledge so it is best to just ask the pro. Like I said, be more responsible with your medicine! Some medicine has to be properly stored in a specific place. Especially the insulins and those medicines in dark bottle. Most medicine just needs to be stored in a cool (as in no direct sunlight) and dry area like in the cupboard. People usually thought cool means refrigerator. Usually, if it has to be kept in cold storage, there will be a designated temperature written on it so that you will know it is not just cool but a specific kind of cool cool. Ask the doctors about it so that you will not keep it at the wrong places. However, a pharmacist usually knows best about medicine safe keeping. #6 Before or after food? Medicines can affect your stomach or have different absorption into your body depending on either you just eat or not. Your medicine can be affected by the food you eat that leads to different absorption issues. For example, vitamin C. Since it is acidic, it is wise to take it after eating. However, to eat a medicine directly after eating is not a good habit since they are a lot of thing in your stomach that time which may somehow affect the medicine absorption. This may hinders you from getting the full benefit from the medicine. Even though it states after food, it should be like half an hour after eating (after a bulk of your food have been processed). Same to before food, give sometimes for medicine to be absorbed before you eat anything. #7 Do I Need to start on a supplement. If you eat healthily, good chance is that the basic requirement of your body has been fulfilled. Supplements, which usually cover vitamins and minerals is a good practice if your body didn't have enough of it. Although there is some research saying that people do get less cold and cough when they practice eating vitamin C (improved immunity). These vitamins and minerals advantages that you read, are true but can only work after taken in some time (usually months). If you want to try eating some supplement, have a talk with the pharmacist the kind of supplement that may benefit you. It is important that you talk to a pharmacist because there are supplement that have been thoroughly researched and there are some which are just faux new. Don't forget to share the kind of medicine you are on at the moment because some supplement may affect the medicine action. That is it. Omg I rambled so long and I am so sleepy right now. I just have to finish this now. I guess what I'm trying to say with these practices is that we should be more responsible with the medicine we take and not blindly follows everything you were told to. Lately, there are plenty of cases where the patient refuses to take their medicine and end up in life threatening situation. Some people just stop believing in medicines because they can't see the benefit when it was them taking it wrongly or just the medicine didn't suit them but they didn't talk it out properly with the doctor. Malaysian has grown to become more advanced day by day and becoming a responsible medicine user is just another step in this era. Informative entry. Thanks for sharing. Sometimes people want instant result . That is not possible most time. Hence the waste. They don't value medicines from the govt hospital especially when freely given to them. They might think twice if they have to pay for every pill. exactly, actually, kkm practice printing the price of the medicine. didn't really work i guess. exactlyyy, the worst thing is those sellers. they knew how people "trust" these products more and asked for lots of money for it. it is just absurb. btw, I can surely assure you that menstrual pills (i assume it is the painkillers) didn't cause infertility. i never finish offf all the medicine / piils given. 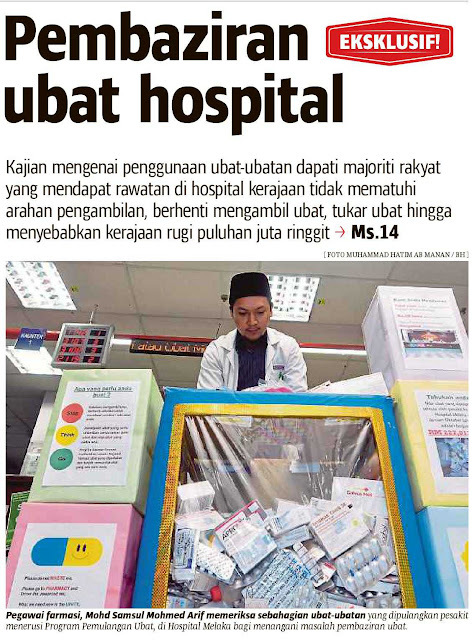 next time maybe boleh mintak kurangkan, omit certain meds that you usually don't really need. or just take notice the expiry date so next time you got sick maybe you can still take the medicine.